UberStix Construction Sets Play Nice With Others | OhGizmo! By Andrew Liszewski on 04/23/08 • Leave a comment! It would take a truly unique and mind-blowing building toy to topple the LEGO empire, but instead of trying to replace those famous plastic bricks, the makers of UberStix have decided to just play nice with them. While you can happily use UberStix on their own, the pieces are compatible with LEGO, K’nex, Erector and other well-established building sets on the market. From what I can tell, the UberStix pieces closely resemble K’nex, and while they can be used for building bridges and other immobile structures, they’re apparently even better when used to build things with motion and movement. The fact that the product shots show a pistol in action will probably guarantee at least a few sales. ThinkGeek is currently selling 2 UberStix sets. The Building Set includes 450 UberStix pieces, a 40 page ‘Basics’ book and instructions for building 5 different projects. It will set you back $39.99. 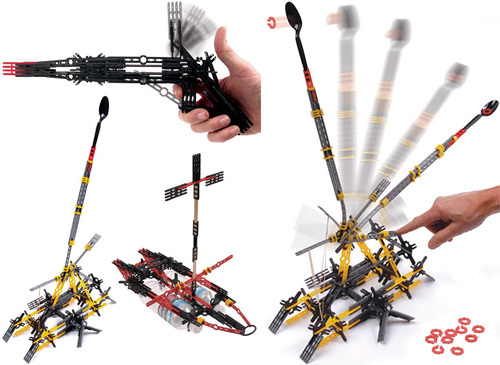 There’s also the UberPult Set which includes 181 UberStix pieces, the 40 page ‘Basics’ book and instructions for building the UberPult itself. It’s a bit cheaper at $19.99.